You know those ladybugs that appear on the insides of south-facing windows this time of year? They used to be my first line of defense against aphids. I would vacuum them up with my Dustbuster, which made the ladybugs dizzy but otherwise caused little harm, and then sprinkle the stunned bugs around the greenhouse in late afternoon or early evening. Next morning, as temperatures warmed in the greenhouse, the ladybugs would go to work like little tractors, methodically crawling up and down leaves gobbling up aphids. The problem is that the ladybugs can’t get past the new windows I installed a year ago in my house. But no need to resort to pesticides. A blast of water from the hose in the greenhouse is sufficient to knock many aphids off the leaves. It’s important to get both sides of the leaves. And it is important to keep up with burgeoning populations. 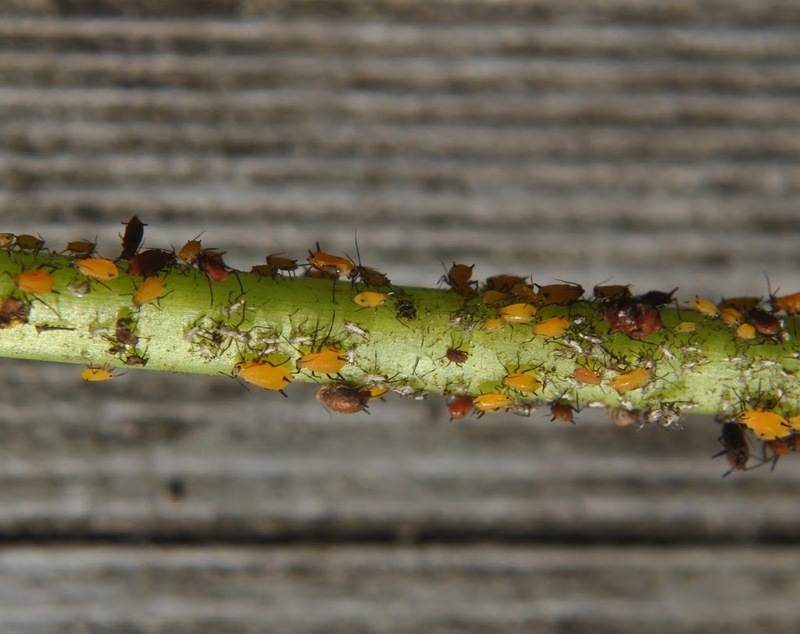 Aphids are amazingly fecund, under ideal conditions their populations doubling every couple of days. They reproduce by mating, like most other animals, and also by parthenocarpy, that is, without mating. Sometimes they lay eggs and sometimes they give birth to live young. I’ll also keep an eye on other greenery in the greenhouse because a single aphid species can attack many different host plants. Natural controls, including other insects, rain, and cold, help keep aphid problems in check. But natural controls are not as effective in the greenhouse as outdoors, where I rarely encounter aphid problems worth bothering about. So I’ll be regularly blasting the greenhouse plants with water in the coming months. And, no doubt, eating some aphids. 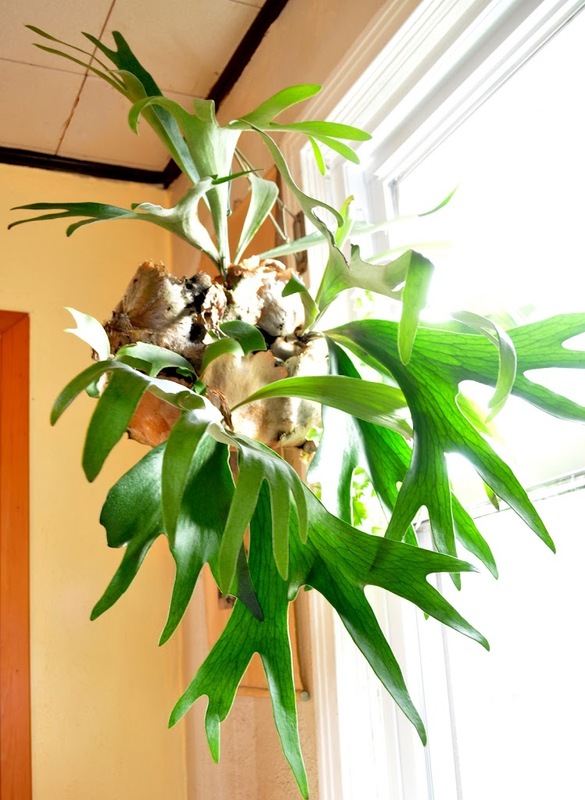 Staghorn fern is among my weirdest houseplants, especially as it grows larger and larger. About 1990, I bought the plant, a cute little thing in a 3 inch flowerpot. I also bought a softball-sized chunk of tree fern fibre on which to grow this normally epiphytic plants. The plant went into a hole gouged into the fibre, then was held in place with wrappings of fishing line. An eyebolt screwed into the fibre offered a convenient way to hang the plant. Staghorn fern grows two kinds of fronds. The fertile fronds are green and are the ones that resemble stag horns in shape. Infertile fronds are tan and hug the soil, tree fern fibre, or — the usual support for an epiphyte — organic duff accumulated in the crotch of a tree. Over the course of the 20 some odd years the plant has called that fibre block home, it’s grown many fertile and infertile fronds. The infertile fronds have totally enveloped the fibre block to hide it, and the fertile fronds now appear at various places around the tawny mass. Most growth is in summer, when seedlings of other plants, including cedar trees and other kinds of ferns, sometimes take root in the moist mass. In winter, when the plant is indoors and hardly ever watered, these interlopers usually die off. The staghorn fern tolerates some drying out in winter, which is a good thing because watering it entails putting it in the bathtub and then giving it a shower long enough to let the water penetrate through all the layers of sterile fronds to wet the tree fern fibre. I let the plant set a couple of hours to let excess water drain away, then return it, now weighing about 10 pounds, to its east-facing window. The wild fern interloper that established itself in some crevice in the sterile staghorn ferns last summer seems to be thriving along with the staghorn fern this winter, which should make for an even more interesting hanging plant in years to come. Today is a big day, the first seed sowing of the 2012 gardening season. Lettuce and onions. The lettuce for the greenhouse. The onions for eventual transplanting outdoors. Some of the lettuce seeds will go right into the ground in the greenhouse and some of the seeds will be sown in seed flats for later transplanting in the greenhouse. The seeds sprout sooner in seed flats but the plants are more resilient, less apt to dry out or go to seed, when started right in the ground. The plan is for these new lettuce plants to come into their own just as the last of last autumn’s lettuce plantings are harvested. 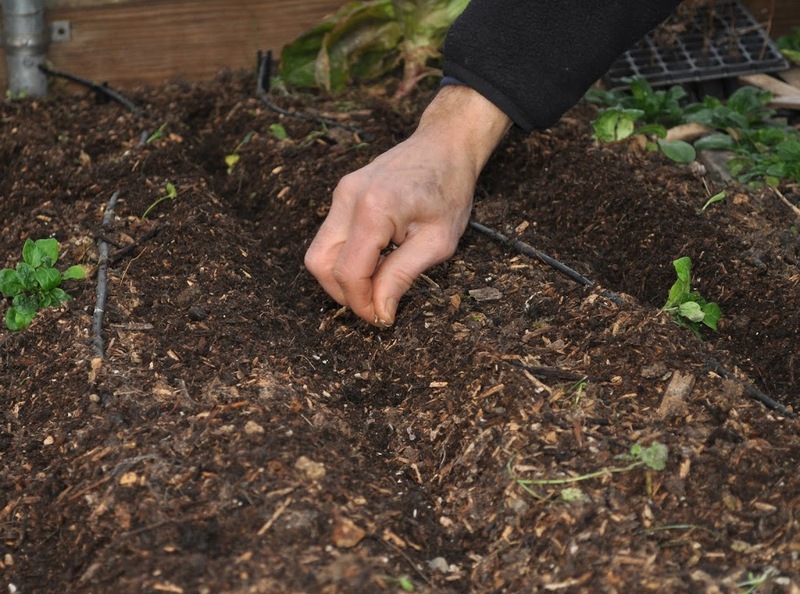 How early can I plant any cold crops outside? Lettuce, spinach, carrots. Thinking about putting down black plastic to help warm the soil then use row covers to create a mini green house effect.